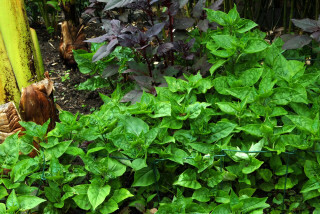 Mirabilis jalapa, Four O'Clocks or Marvel of Peru are an undemanding, highly floriferous plant, useful for filling less prominent gaps between taller plants. 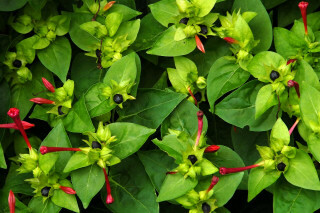 The flowers are said to open after 4pm but shade is more of a deciding factor than time of day (the flowers open when in the sun is off them but are not specifically shade plants). The flowers are said to be particularly fragrant but unless you stick your nose right up close this attribute may well pass you by. 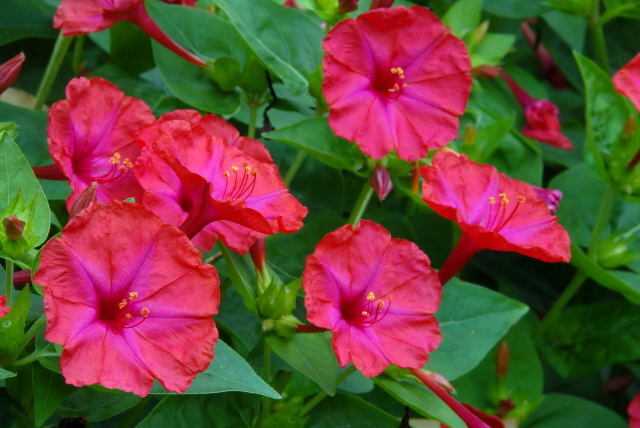 Four O'Clocks have short lived flowers but the flowers are produced in abundance. There is a definite beginning, middle and end to their flowering cycle, (popcorn style) with the end coming just a bit too soon. In those rare hot summers of yesteryear (Mid 00's) the peak flowering period can be over as soon as late July. Once the plants have produced seeds in sufficient quantities they feel their work is done for the year and begin to fade as plants, adopting a perennial lifestyle. Plants are easily raised from large black seeds. 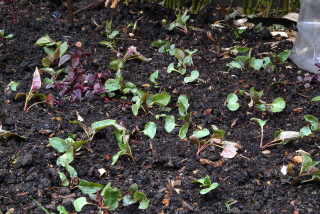 Germination rates are very high so Mirabilis jalapa seeds can be planted individually in cells. Once they have grown big enough to handle they can be transferred to individual 3" pots until it is time to plant out in the garden. They can be sown directly in the border but that is probably something to leave until year two when you will have buckets full of seeds at your disposal. 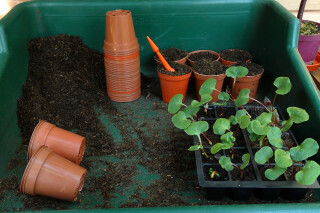 First year plants will grow to around 2 foot (60cm) or slightly more, plants in their second year will double that. 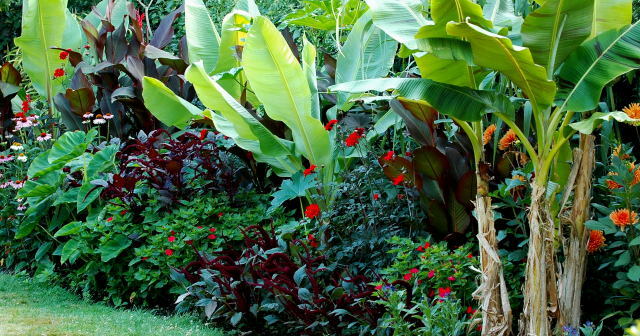 Plants grown to the front of a grouping will remain shorter, taller plants peering over from the rear. 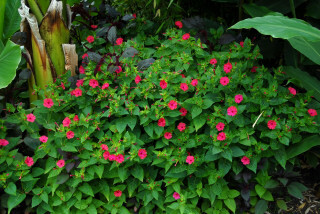 This picture (21/July) shows Mirabilis jalapa plants growing in a mixed tropical border. The groups are to the left of the banana pseudos and in between the two batches of purple Amaranthus. Already the Mirabilis are showing signs of 'going over' (coming to the end of their flowering cycle) with a good eight weeks growing still to go. The following year at almost the same date (24/July), self sown seed of the two batches of Four O'Clocks had been allowed free reign. To the extreme right of the picture the tall green plants are Mirabilis jalapa that have regrown from tubers developed the previous year. The plants grow much taller much faster from a tuber. 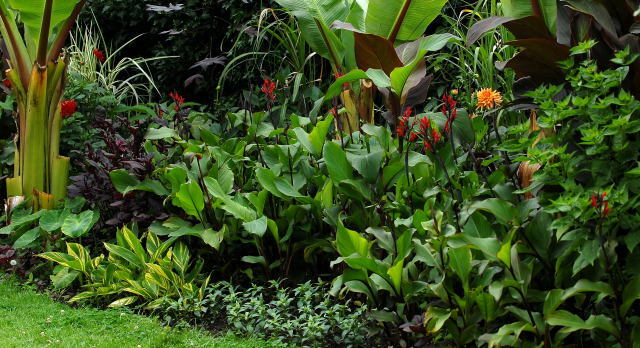 In the front of the border to the right of the Alpinia zerumbet 'variegata' there is a gap filled with some emergency off the shelf bedding. Previously there had been a community of self-seeded Four O'Clocks that got way ahead of the rest of the border and had to be removed on aesthetic grounds. Once the flowers are over the plants are not much to look at. The picture to the left shows a one season old tuber of a Mirabilis jalapa plant. 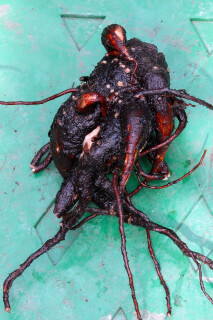 Four O'Clocks tubers are hard to spot in the soil as they cunningly disguise themselves as mud. 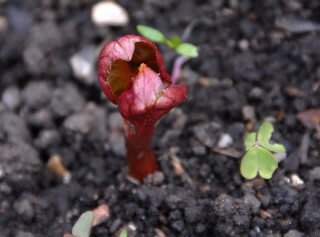 The picture to the right shows an emerging shoot from an underground tuber. Although these shoots appear a bit later than self sown seedlings, the growth rate is rapid and soon overtake any seedlings. Literature suggests that in warmer climates these tubers can become quite large and hard to dislodge form the ground. This has never been an issue in this UK garden. 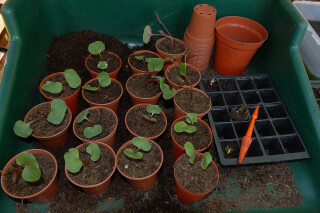 The amount of seedlings that go on to produce plants that re-grow in their second year is very small. After flowering the plants produce tons of seed. Each flower responsible for one black seed. These Mirabilis seeds can be gathered for next year or simply allowed to fall to the ground to produce countless seedlings in the spring. 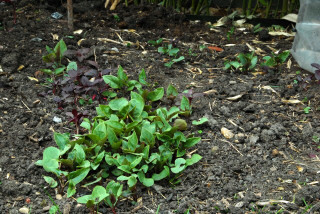 The following spring, clumps of Mirabilis seedlings appear and like the apple, do not fall far from the tree. Typically there are far too many in one spot and not enough in an other. This is easily remedied by digging up the seedlings and spacing them out. The same Four O'Clock self sown seedlings, spaced out and watered in. A coarse frame work was constructed using short link stakes. Initially this is quite ugly but the plants soon grow to cover them up. Staking of any plant is always easiest before they have fallen over. (BTW, The Victorians used specially made metal grills on legs which were placed over emerging delphiniums to keep them up right). 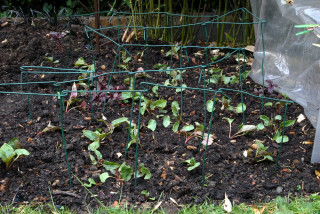 Five weeks later the majority of stakes have been hidden by the Four O'Clocks foliage. In conclusion, Four O'Clocks have nice flowers but some thought needs to go into where they will be grown in the border. A great swath of the plants may look spectacular when in flower but look uninspiring once the flowers have finished.